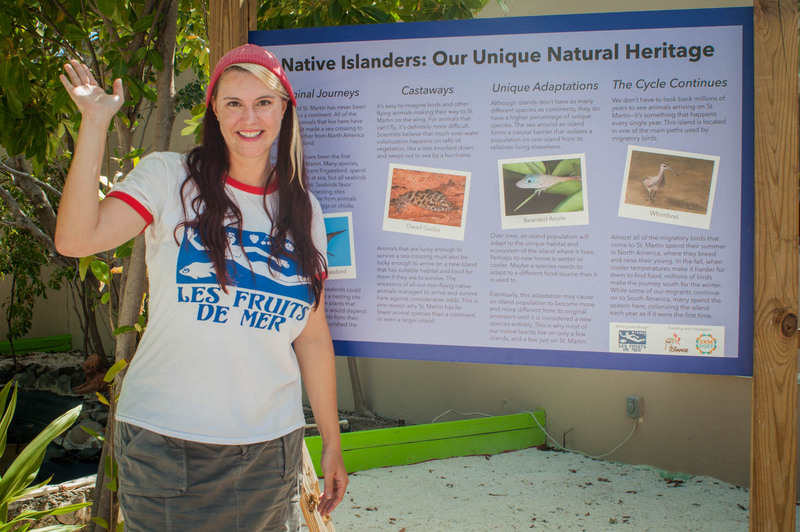 The St. Maarten Zoo now features ten panels about native wildlife designed by Les Fruits de Mer. Island residents and visitors are invited to get in touch with the wild side of “Only on St. Martin” this Sunday at the third annual Endemic Animal Festival. 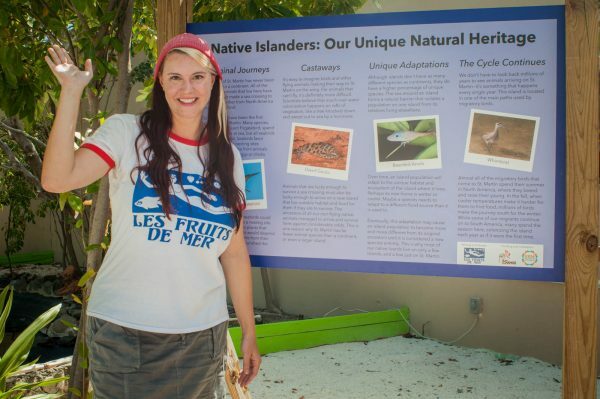 The free wildlife discovery event, created by the Les Fruits de Mer association, celebrates the animals that are found only on this island or only in this region. The 2016 Festival will be held from 9am to noon on April 24th at the St. Maarten Zoo in Madame Estate. The event offers a full array of fun designed for kids, families, and people of all ages, including an endemic wildlife walk with a native animal checklist, free native animal activity books, and a variety of wildlife-themed art activities. 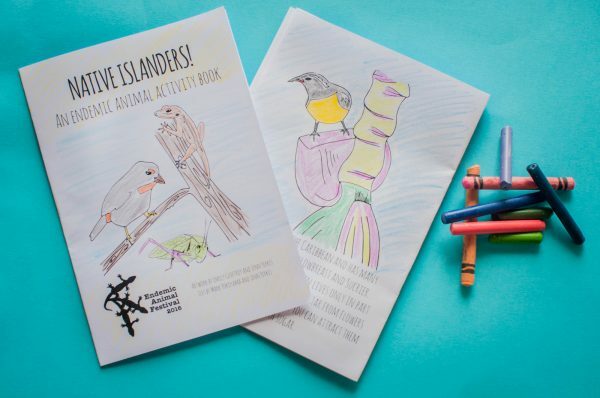 Fun native animal activity books will be given away free at Sunday’s Endemic Animal Festival. 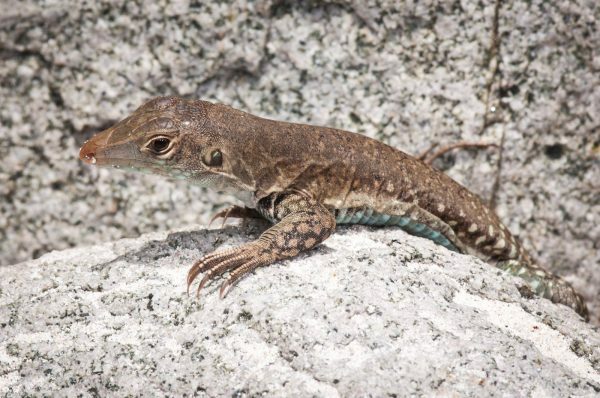 Festival-goers can get an up-close look at St. Martin’s native wildlife at the Endemic Animal Discovery Station, where experts will be on hand to talk about the live endemic animals on display and answer questions. A Bird Observation Station staffed by a professional birding guide will be set up on the Great Salt Pond next to the Zoo, where attendees can learn to use a variety of birdwatching scopes and binoculars to spot native birds and other wetland wildlife. At the Art Station’s craft workshop, children will enjoy creating their own endemic animal crowns to become kings and queens of the Festival. While this year’s festival is the third Endemic Animal Festival on St. Martin, it is the first to be held at the St. Maarten Zoo. With new native animal signage and a variety of new native plants and trees, the zoo is developing its potential as a botanical garden and a space to observe native animals. This Sunday will also feature the launch of the completely renovated petting zoo, and a sneak preview of the new Monkey Bar, which will offer a special mini-menu of savory panini, barbecue, salads, snacks, and drinks at the Festival. Our local Ground Lizard, a subspecies found only on St. Martin, is showcased in the St. Maarten Zoo’s native animal signage. The third annual Endemic Animal Festival takes place from 9am-noon on Sunday, April 24th at the St. Maarten Zoo on Arch Road in Madame Estate. The event is open to the public and completely free, thanks to the generous support of the 2016 sponsors: Buccaneer Beach Bar, Calmos Cafe, Delta Petroleum, Hotel L’Esplanade, Lagoonies Bistro and Bar, Loterie Farm and Tri-Sport. For more information, visit: http://www.lesfruitsdemer.com or find Les Fruits de Mer on Facebook.